With the wide range of career paths available to real estate professionals, each agent has a different story to tell. In this series, we bring you the stories of successful individuals who’ve taken their real estate careers in various directions. We sat down with each of them to talk about how they got started in the industry and the twists and turns they’ve taken along the way. Keep reading to learn about real estate team Ren and Susan Snyder’s path to success and find out what insights and advice they have to offer new agents. 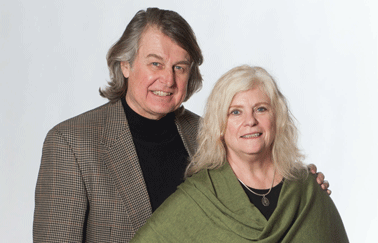 Ren and Susan Snyder have been in business in the Ann Arbor, Michigan, area for more than 20 years. If they have a specialty under the broad umbrella of residential real estate, it’s relocation. The Snyders are especially known for working with incoming and outgoing University of Michigan faculty (residential turnover in a university town is always high), and for their connections to various local service providers. The Snyder Group is part of the Charles Reinhart Co., a well-known name in Ann Arbor. One of the Snyders’ value-adds, whether they’re representing the buyer or the seller, is their network of connections to real estate–related service providers, such as mortgage brokers, movers, contractors, stagers, and home improvement retailers. They insist that they get more leads as a result of their position as a leading source of information than they do based on their ability to close a transaction. The couple’s progress might look fairly typical to most observers. They developed their real estate business as many agents and brokers do: starting with family and friends. In their early years in the business, they made a point of building a network and staying connected to their clients around the clock: a commitment they insist is crucial to any agent’s success. Q: What does your business look like, and how has it evolved? Ren: We have a personal approach; we think in terms of people and relationships first, then business. Our friends become our clients and vice versa. Most of our family members are clients and most of our business comes through personal referrals. Some of our employees are former clients. The Snyder Group, which we formed in 2005, consists of us and two partners who are not exclusively buyers’ agents; they list properties as well. Susan and I work together with sellers on the listing/marketing end, and I work with buyers. We focus on Ann Arbor and Washtenaw County, and our business has expanded to some of the outer areas. Susan: I became a real estate agent in 1990. I had been a respiratory therapist at the University of Michigan. I really enjoyed that, but after 20 years I decided I had to remove myself from patient care and move on to another career. I thought about teaching, but I didn’t want to work in a classroom all day. I still wanted to work with people, so I went to work for Dawn Foerg, a very highly respected broker in Ann Arbor. Ren: Susan took a test, when she was thinking about a career change, that indicated that if she worked hard, she might be mediocre as a real estate agent. In her first year, she sold 32 houses, mostly to people she didn’t know at all. It was a remarkable success story; my company started using her as a pitchwoman in their ads. I joined Susan in residential real estate. I’d gone to college late; I was going to be a blue-collar philosopher with a small business, but decided I didn’t have the confidence to run a gas station; I needed importable credentials. I studied business and accounting at Eastern Michigan University so I could get a job quickly, to support my family. I joined Hoover Universal, a Fortune 500 company. We moved with that company to Kentucky and Indiana, which gave us experience in buying and selling homes, and relocating. I later became vice president of administration for a high-tech company that was acquired by Kodak and spun off—and when that happens, the CEO is always the first person out the door, and the vice president of administration is next. By the time I got into residential real estate, in 1993, Susan was already a star. As partners, our annual sales volume was about $6 million by the mid-1990s. Q: What’s your current volume? Ren: We hit $15 million in 2015. That was about the level we had hit before the economy tanked in 2008, and we’ve steadily worked our way back up. Q: What’s your main value proposition? Susan: We know a lot about what we’re doing; we tell people what we think and why we think it. With the information we provide our clients, they’re able to make the best decisions. We’re in a very personal business. We’re not working with nameless, faceless, soulless “consumers.” We’re real people working with real people. Relationships first. Business second. And we do a lot of business. Q: Do you consider yourself a niche company or are you more generalized? Ren: We’re with Reinhart Realtors, which was recently acquired by Real Estate One, the largest firm in Michigan, and they love our niche. Our business is divided between buyers and sellers, and we do a lot of business with University of Michigan faculty and staff, including quite a few incoming department heads. Susan and I take care of them personally. We’ve got it down to a science, giving them a lot of context and personal connections. As for the type of product we sell, every year we’ll sell something in the $70,000 range, but we sell million-dollar homes too. Our niche is working with really bright people, whether they’re Ph.D, M.D., or G.E.D. Q: What was your most important learning experience, when you were starting out? Susan: I’m very grateful that when I was just starting out, we didn’t have private offices in our workplace: just cubicles. So I got to listen to other agents talking to clients, and one of these in particular taught me all kinds of useful terms and ways of using the language that have helped me ever since. Q: What have been some of the most memorable ups and downs of your real estate career? What are your greatest achievements as a real estate team? Ren: The founder of our company, Chuck Reinhart, has said the secret to this business is building trust, learning what to say and when to say it. We’ve both learned a lot about that. People in our office still come to Susan, especially, when they need advice. Knowing that people look to us for information and guidance: that in itself is a real high point for us. Q: What is the future of your business? Susan: A few years ago, we earned our Senior Specialist designation. Helping seniors and their families make the transition to assisted living is rewarding—helping them move, getting their house ready to sell—but it’s not a big part of our business yet. It may be, in the future. Q: Is your education ongoing? What do you do to stay current? Ren: For the past 10 years, we’ve paid for professional business coaching. I’m part of a group of eight real estate agents across the country that teleconferences every week to share information and discuss how we can serve our clients better. We’ve also formed a discussion group for agents in Ann Arbor. Susan: We’re lucky to have comprehensive and current market statistics, today, such as we didn’t have a few years ago. Through our association with Real Estate One, we get a monthly video and printout for trends in Michigan, the southeast part of the state, and Ann Arbor specifically. The data are all in easy-to-read formats, and give us quarterly information on properties at all price points. If you’re starting out in the business, make a habit of obtaining and learning from information of that type. Wherever you are, geographically, you’ll find that this information is much more available than it was in years past. Susan: Waiting for business to come to you. You have to go out after it. You can’t give great service to just a few people. That might make you feel good, but it doesn’t make you a living. At the same time, you can’t just focus on the numbers game, treating each transaction as just a transaction. A lot of brokers will just say, “Next!” if they’re having trouble with a client, but that attitude isn’t good for you or the industry. Another mistake is under-using the social media. Facebook, Twitter, and Instagram have become vital components of the modern real estate agent’s marketing program. Newspapers are no longer the main part of advertising. Through these new social media, we can publish news articles and send them out to people in our sphere of influence, to keep ourselves top-of-mind within that group, and maybe expand that group. The basics of the real estate world don’t change much, but the best ways to approach those basics do change, and you need to keep up with the changes. Q: What advice would you give a newcomer on how to build up a business? Susan: Be prepared financially. Know what your expenses are likely to be, and be in a position to pay them. Learn about the taxes you’ll have to pay, and how to pay them on time. Learn to draw up a budget and stick to it. Educate yourself on matters that some real estate agents might not know about, so that you’ll be the best possible resource for your client. For example, in Michigan, which has a large Muslim population, Sharia financing might be an issue. Under Sharia law, you’re not allowed to lend money at interest, so some lenders have developed work-arounds that comply with religious law but still keep everyone satisfied financially. We can direct you to lenders who understand Sharia financing. One great advantage of a real estate career is that it gives you the freedom to choose your own path and take your career in the direction that’s right for you—at your own pace and on your own terms. Stay tuned for more blog posts featuring successful real estate professionals, including info on how they got started, where they are now, and where they’re headed.